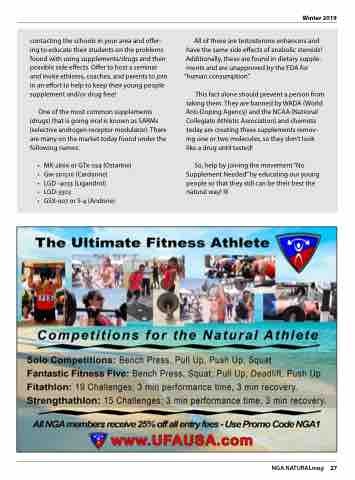 Winter 2019 Winter 2019 contacting the schools in in your area and offer- ing to educate their students on the the problems found with using supplements/drugs and their possible side effects Offer to host a a seminar and and invite athletes coaches and and parents to join in an effort to to help to to keep their young people supplement and/or drug free! All of these are testosterone enhancers and have the same side effects of anabolic steroids! Additionally these are found in dietary supple- ments and are unapproved by the FDA for “human consumption” This fact alone should prevent a a a person from taking them They are banned by WADA (World Anti-Doping Agency) and the NCAA (National Collegiate Athletic Association) and chemists today are creating these supplements remov- ing one or two molecules so they don’t look like a drug until tested!